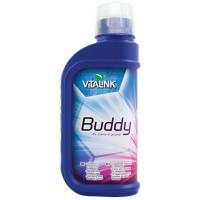 VitaLink Buddy is a fertilizer rich in potassium and phosphorus that with the help of magnesium and sulfur increases the size and quality of the flowers, giving us a crop never seen before. VitaLink Buddy is a PK additive containing optimised levels of readily available phosphorus and potassium in an ideally accessible form for uptake by your plants. It also contains magnesium and sulphate which enhance plants utilisation of phosphorus and potassium. VitaLink Buddy is a superior flowering stimulant that causes an acceleration of the flowering response in your plants resulting in a huge increase in both crop yield and quality. Thanks to its unique composition it is suitable for use during the whole flowering period. VitaLink Buddy accelerates the reproductive processes and encourages plants to redirect more energy into flowering and fruiting. It provides the necessary phosphorus and potassium to your plants without a risk of stressing them with too high EC levels. Use 0.5 ml/L alongside your main nutrients during early flowering, increasing to 1 ml/L throughout the rest of the flowering stage. For best results use in conjunction with VitaLink PK. Do not use WITH VitaLink PK but swap VitaLink Buddy for VitaLink PK during the week of highest demand.